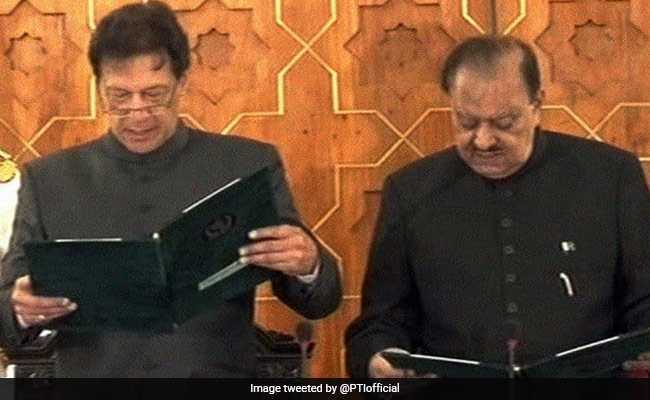 Wearing a traditional grey-black sherwani, a tearful Imran Khan was seen little nervous as he stumbled over some of the Urdu words of the oath administered to him. Imran Khan today stumbled over some of the Urdu words and mispronounced them while taking oath as Pakistan's prime minister. Mr Khan, 65, the Pakistan Tehreek-e-Insaf chairman, was administered a long oath by President Mamnoon Hussain at a simple ceremony at the Aiwan-e-Sadr (the President House) in Islamabad. When Mamnoon Hussain said the words "Roz-e-Qiyaamat" (the day of judgement), Mr Khan did not hear the exact phrase and called out the words wrongly terming them as "Roz-e-Qiyaadat" (the day of leadership), thereby completely changing the meaning of the sentence. Once corrected by the president, Mr Khan realised his mistake, smiled subtly, said "sorry" and continued with his oath taking. Some Pakistani journalists even wondered if the prime minister's oath has changed from past years, Pakistan's 'The News' reported. Salman Masood, The New York Times Pakistan Correspondent, said the oath taking ceremony should have been rehearsed. "President Mamnoon Hussain is trying to speak in immaculate Urdu accent, making it hard for Imran Khan to catch up. Perhaps, Imran Khan should have taken oath in English," he tweeted. Oxford-educated Imran Khan was sworn in as Pakistan's new prime minister today, officially taking over the charge of power in the corruption-affected country nearly 22 years after the former cricket hero entered politics.